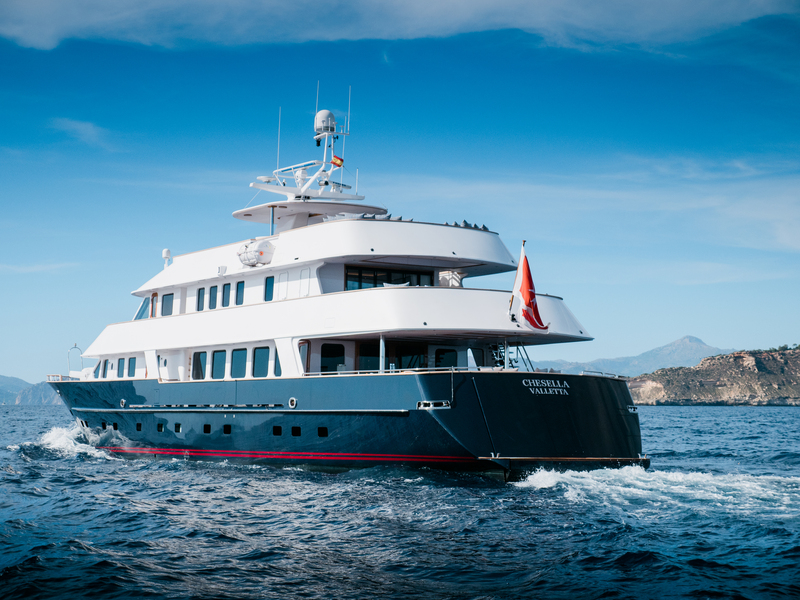 Motor yacht CHESELLA (ex Blue Attraction, Blue Attraction II, and Lady Duvera) is a 38.00m (124' 8") Amels-built yacht with naval architecture by Diana Yacht Designs. 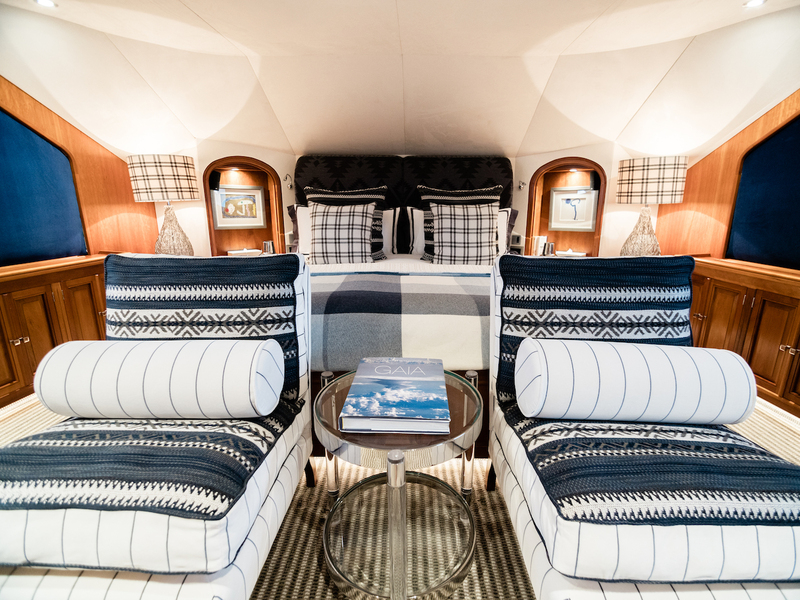 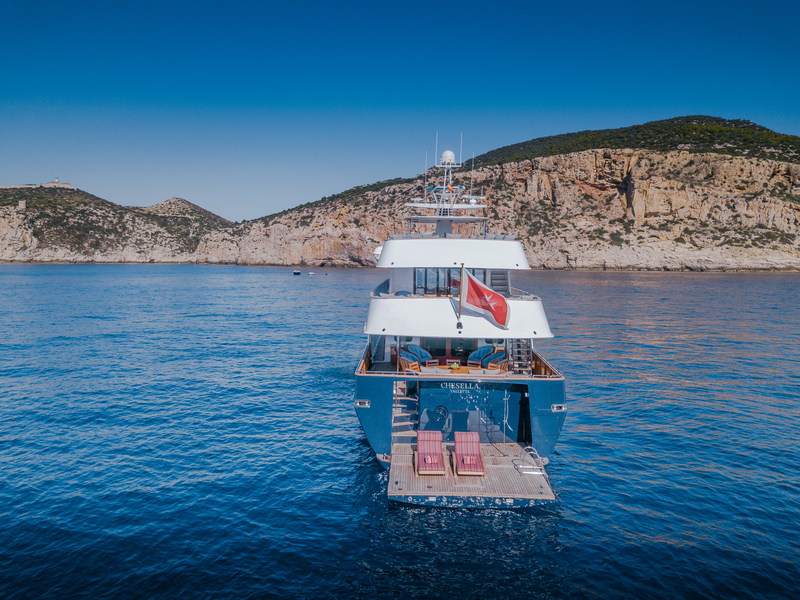 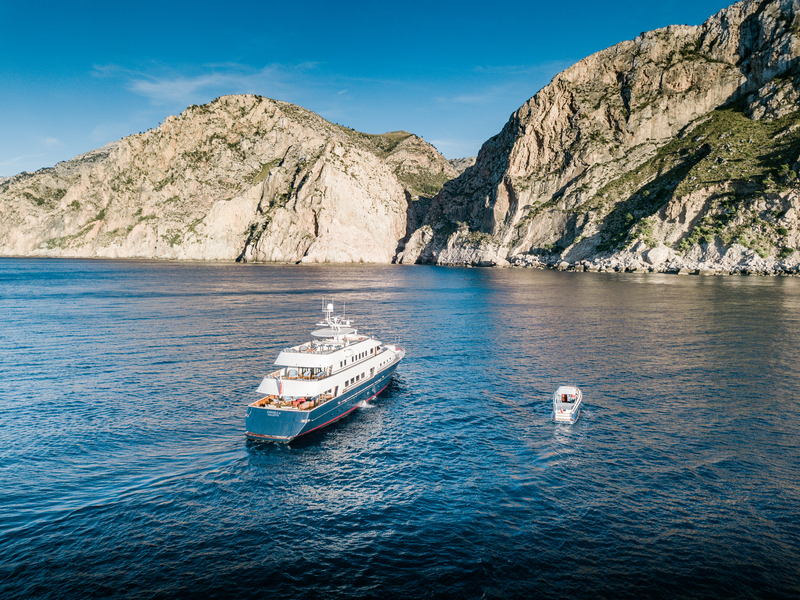 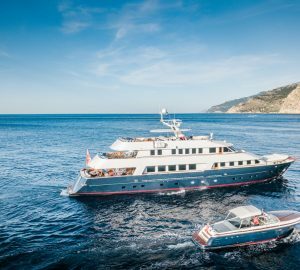 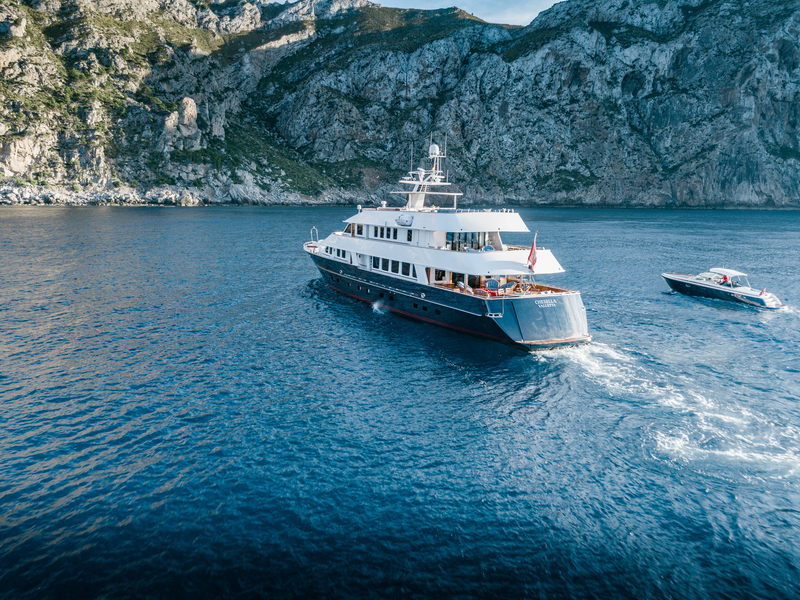 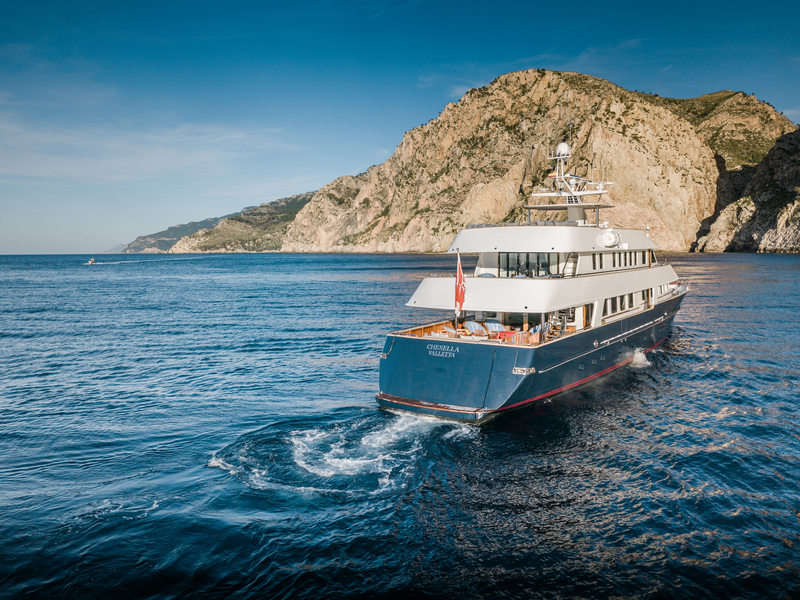 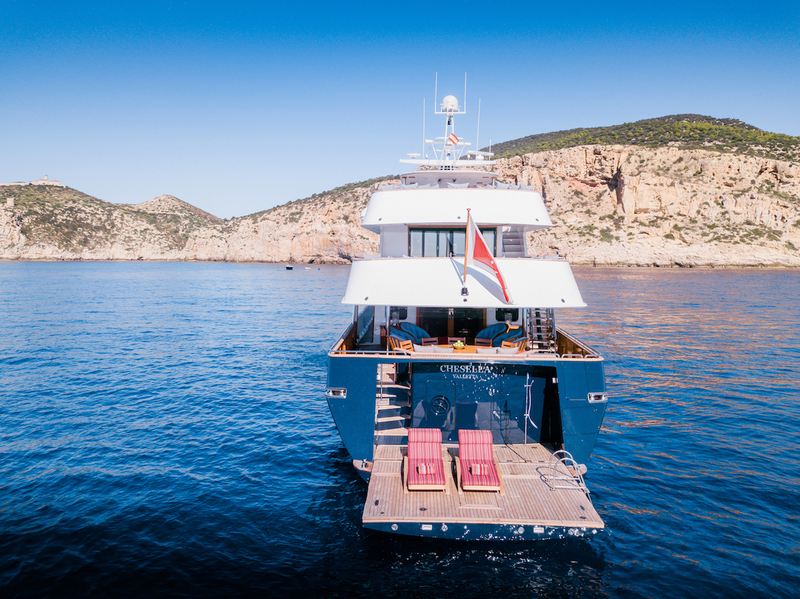 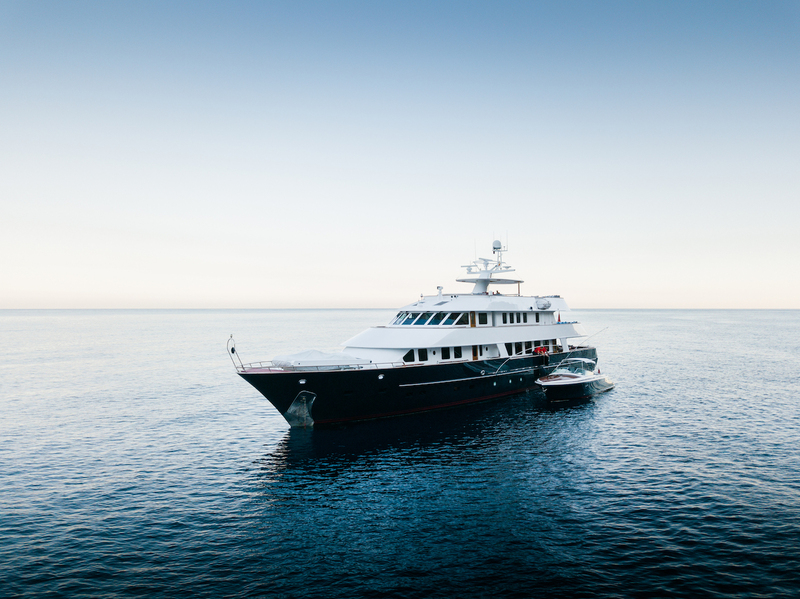 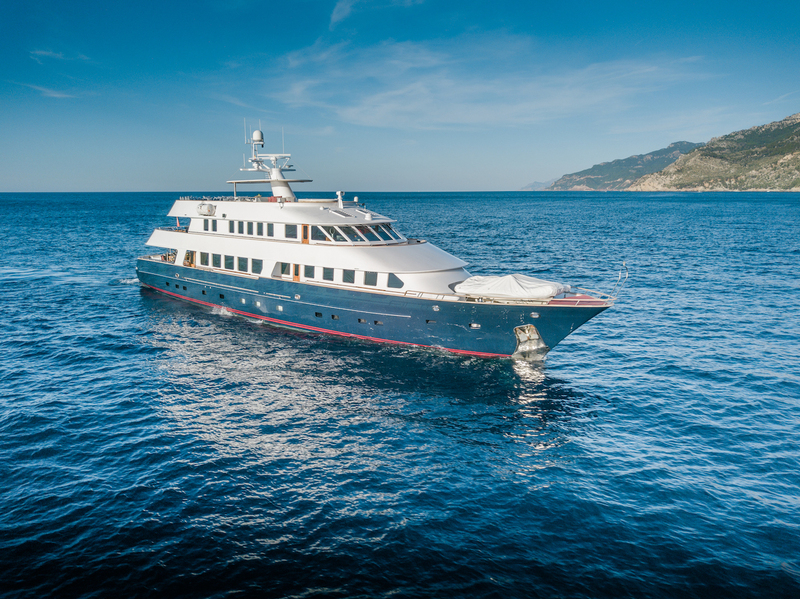 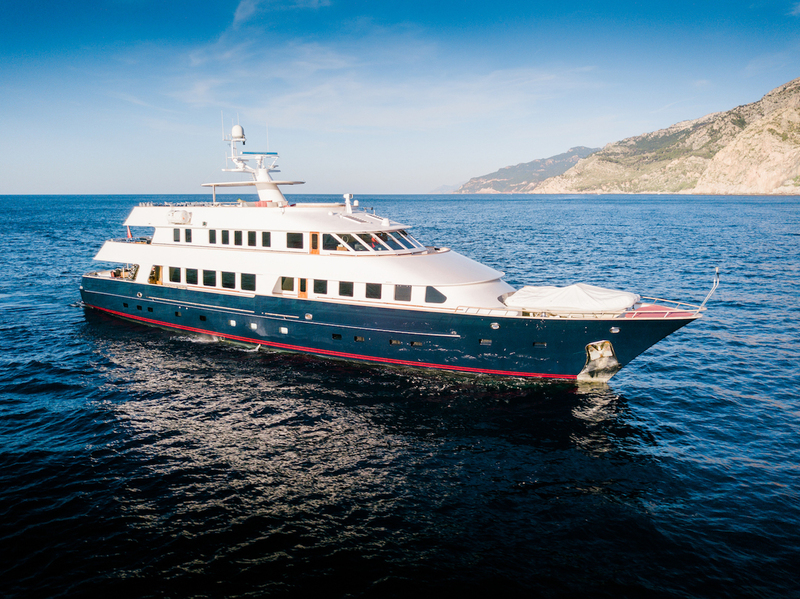 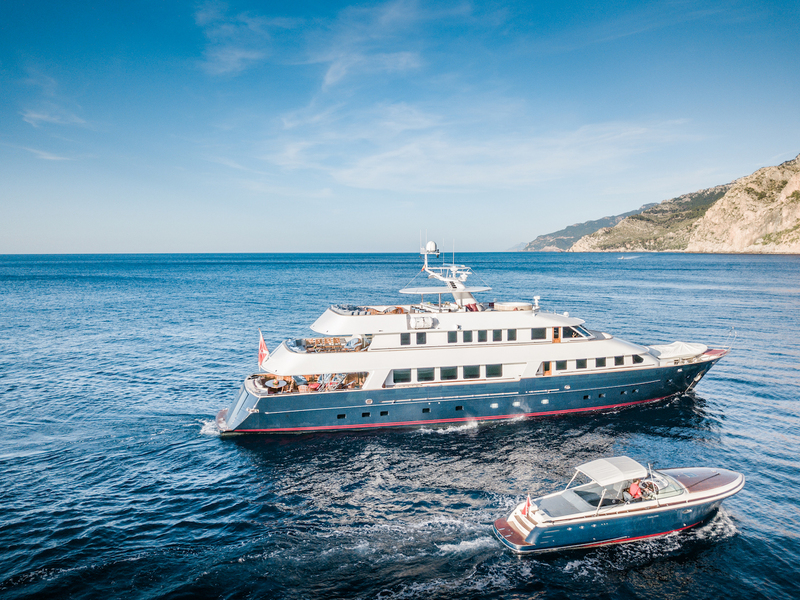 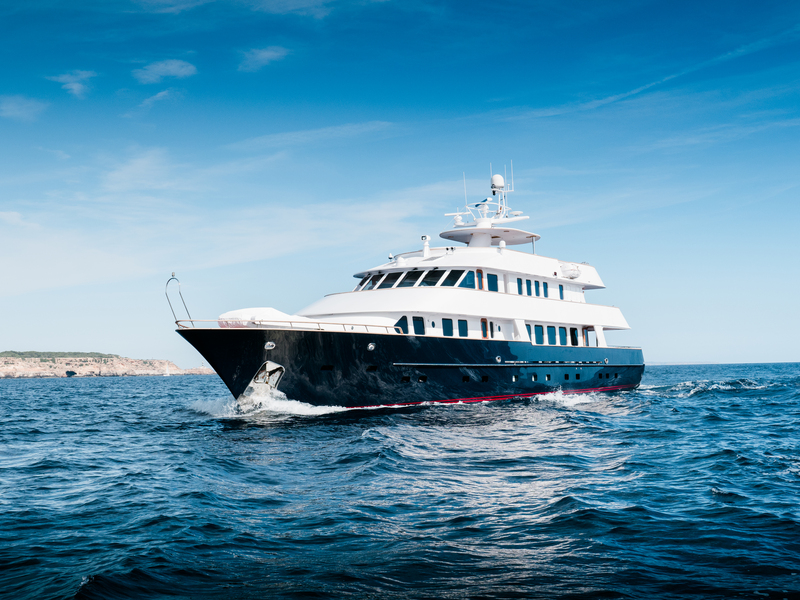 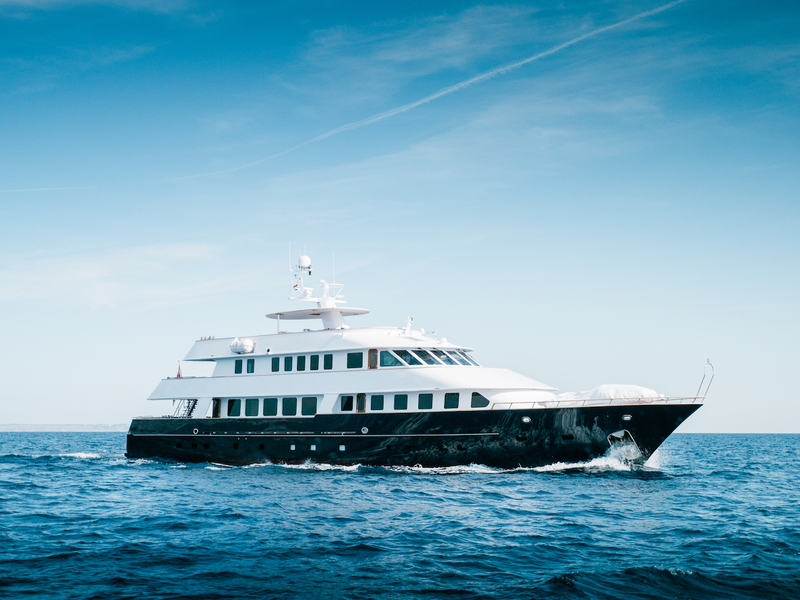 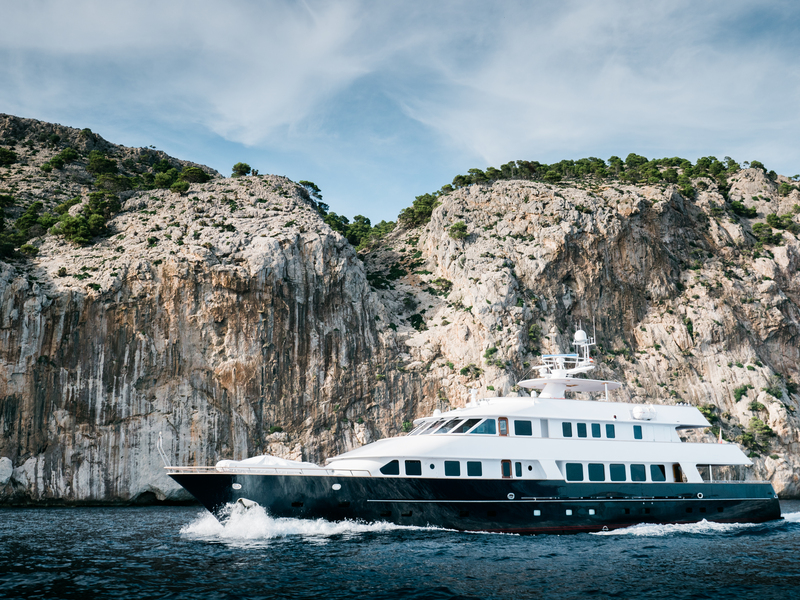 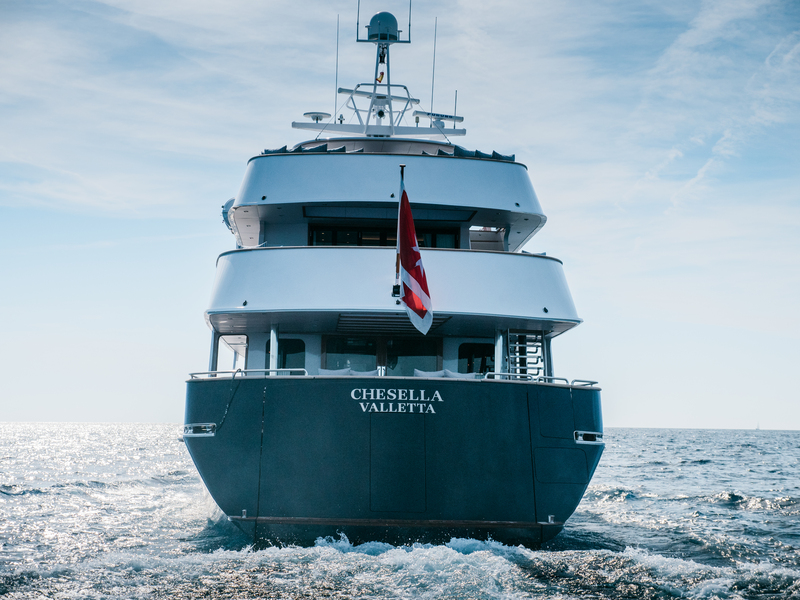 Built in 1983, motor yacht CHESELLA received a major refit and extension in 1995, while her most recent refit was carried out in 2018, with new interiors by Birgitta Sylvan Hedvall, making her the ideal yacht for family cruising. 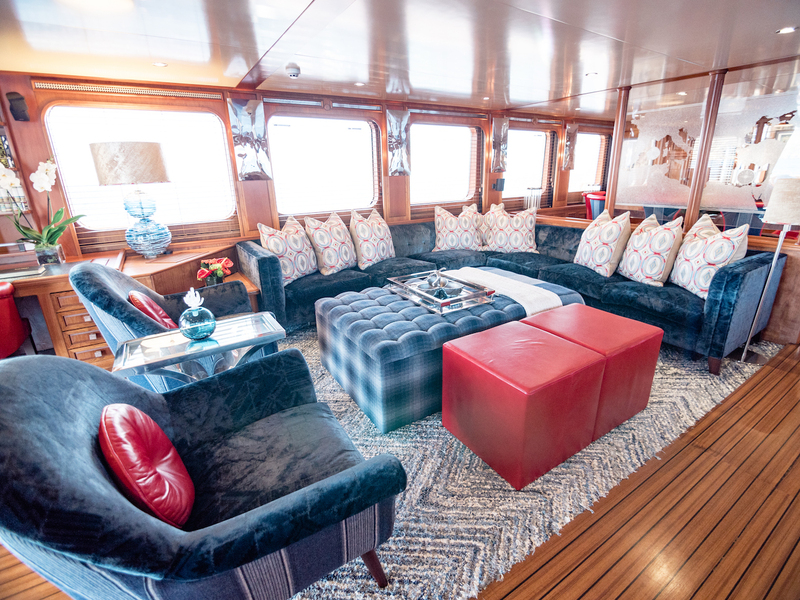 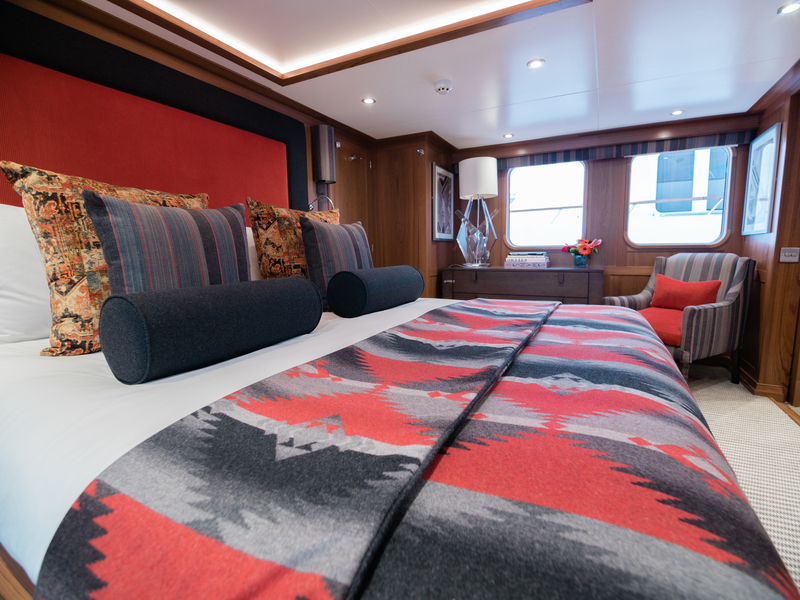 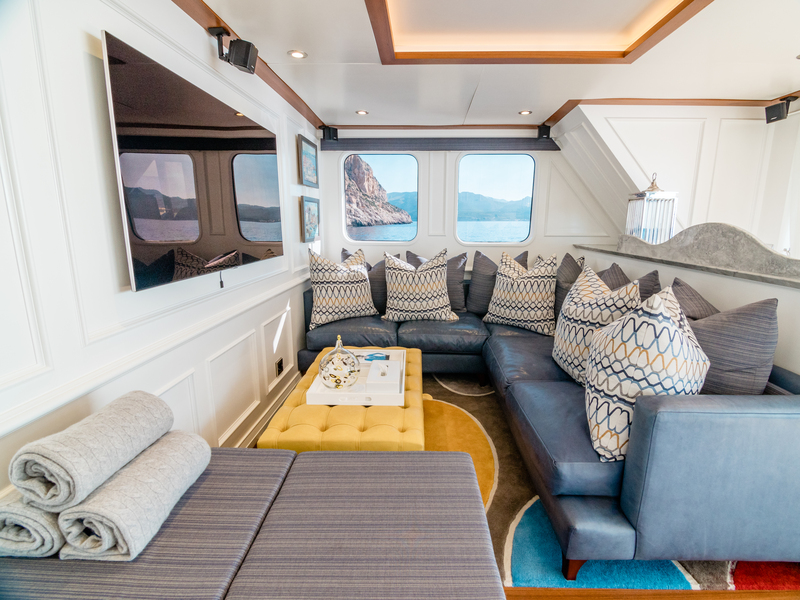 On the lower deck the transom door folds down to create a massive swim platform next to the water where guests have access to the tenders and water toys or use as a sunbathing spot. 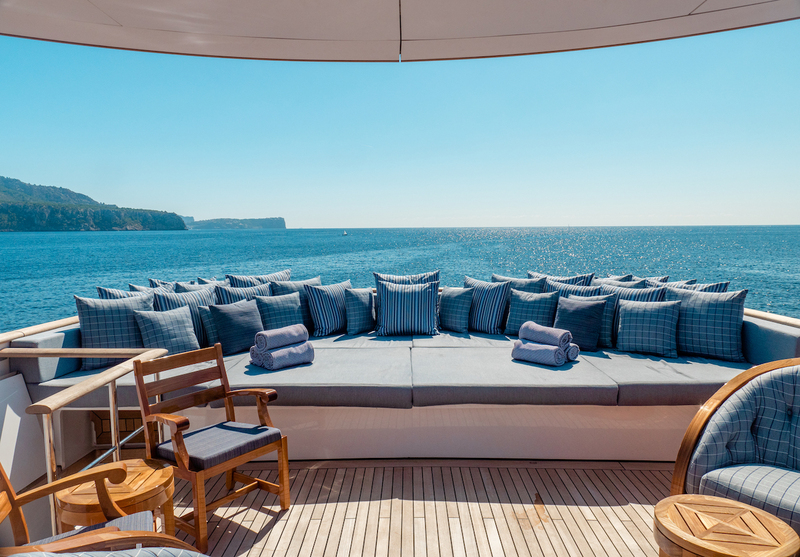 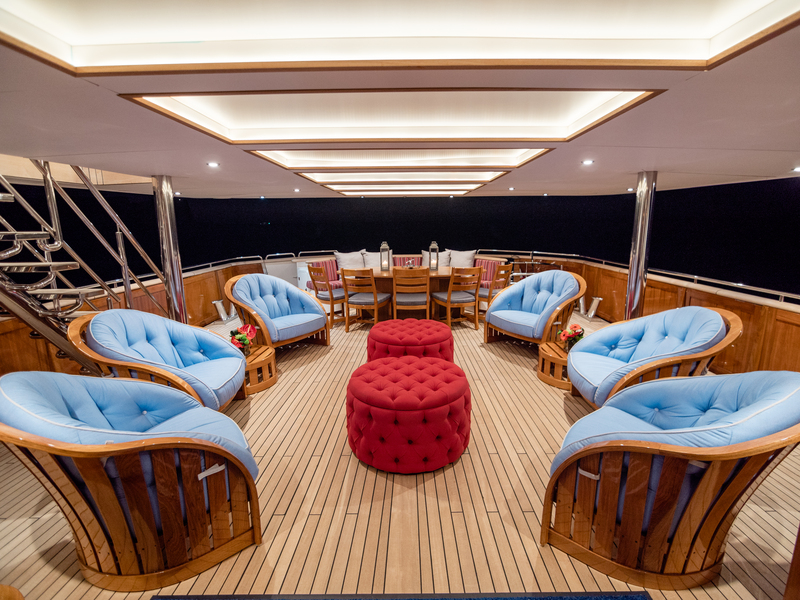 Two staircases connect up to the main deck, where a curving sofa is integrated into the stern and an oval table and additional chairs make the space ideal for alfresco dining for up to 10 guests. 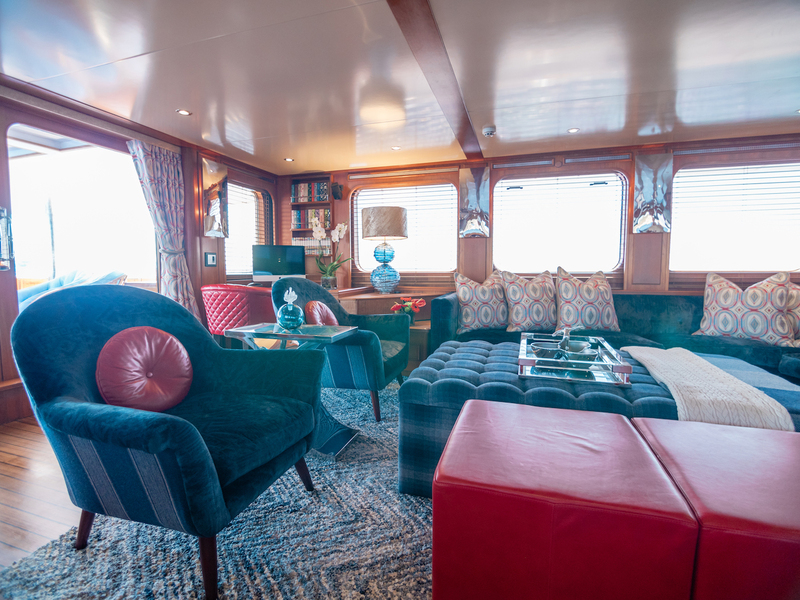 Farther forward, the casual lounge boasts armchairs to port and starboard with drinks tables for laid-back mornings or evening cocktails watching the sunset in the shade. 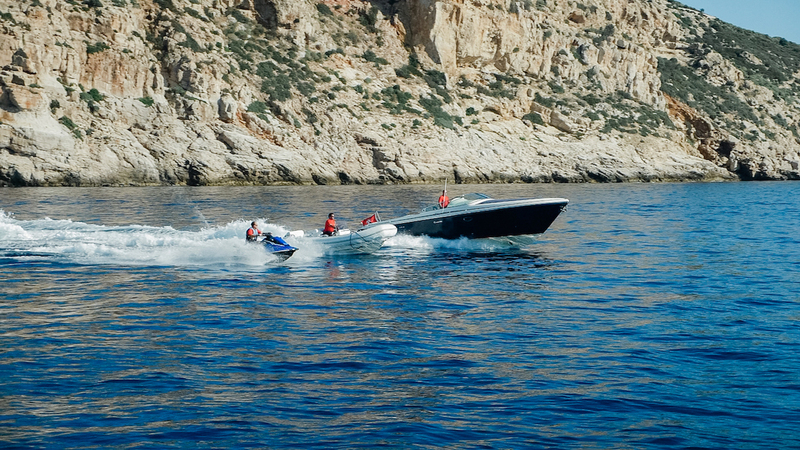 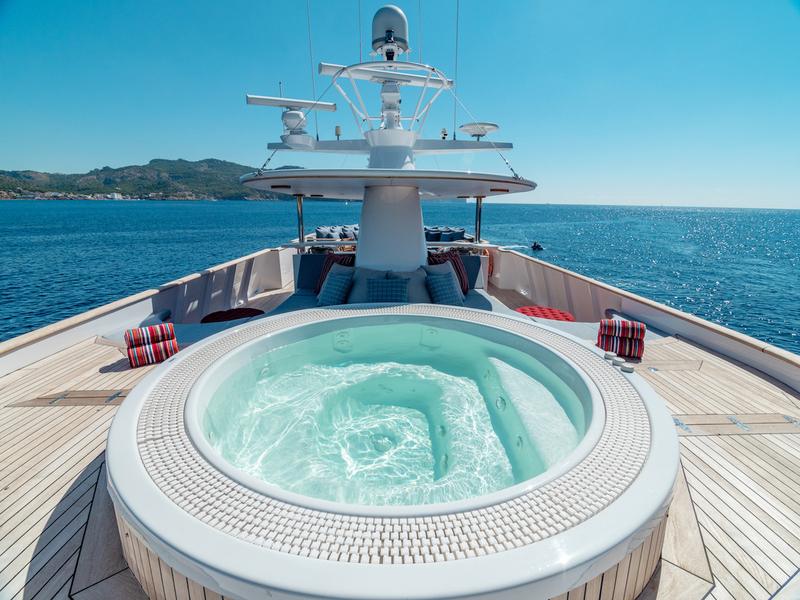 The foredeck is used to store the tenders and motorised water toys, which are launched and retrieved using a Davit crane. 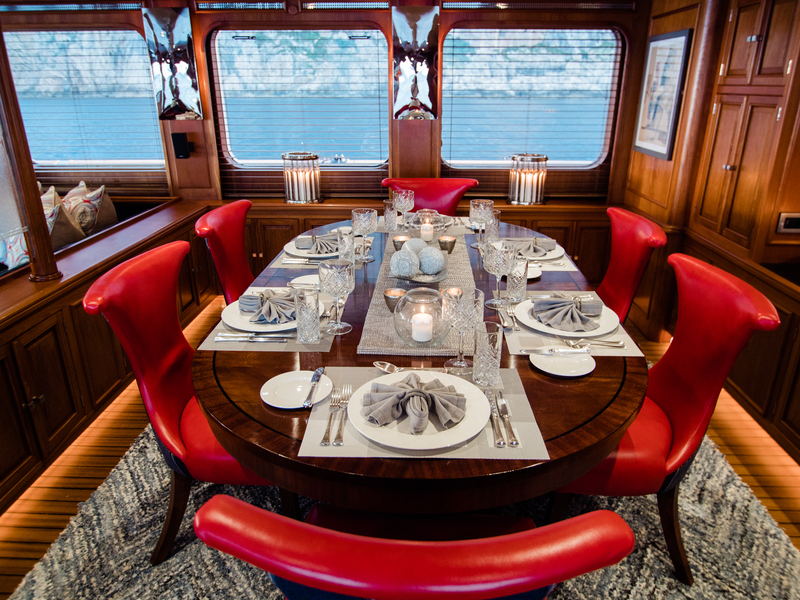 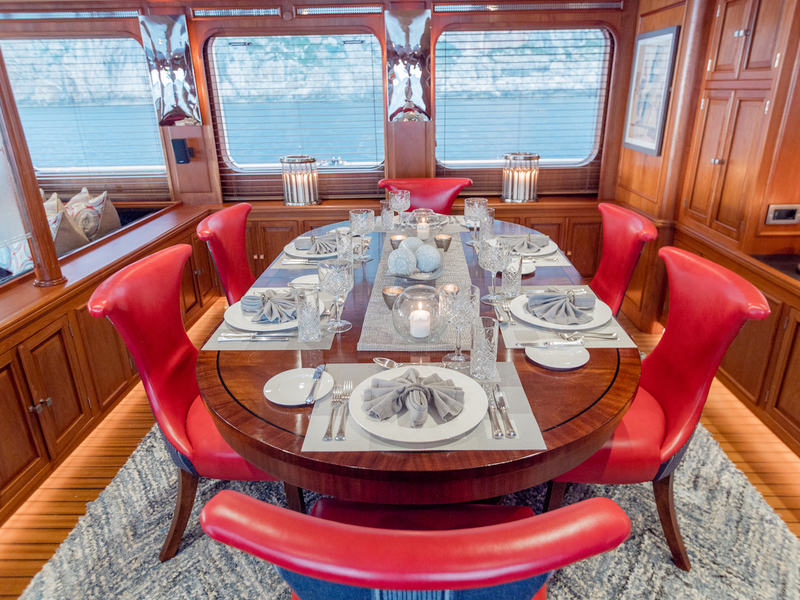 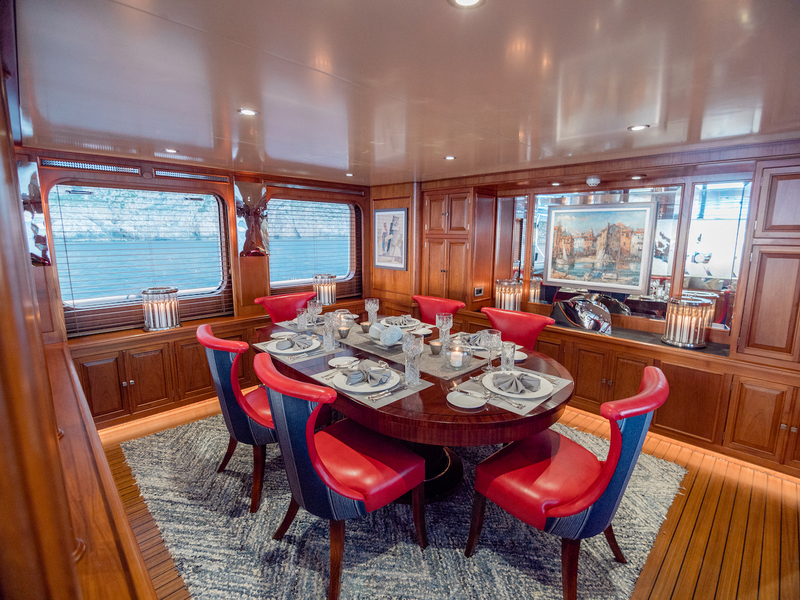 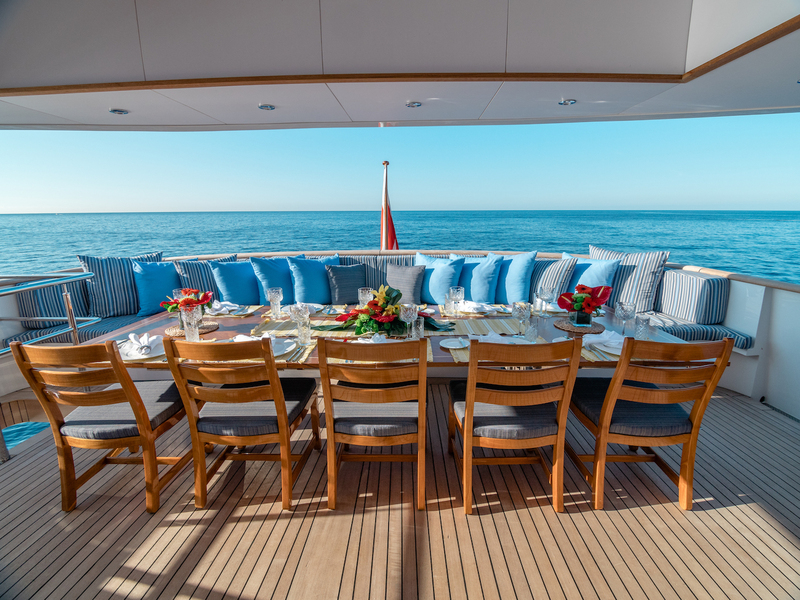 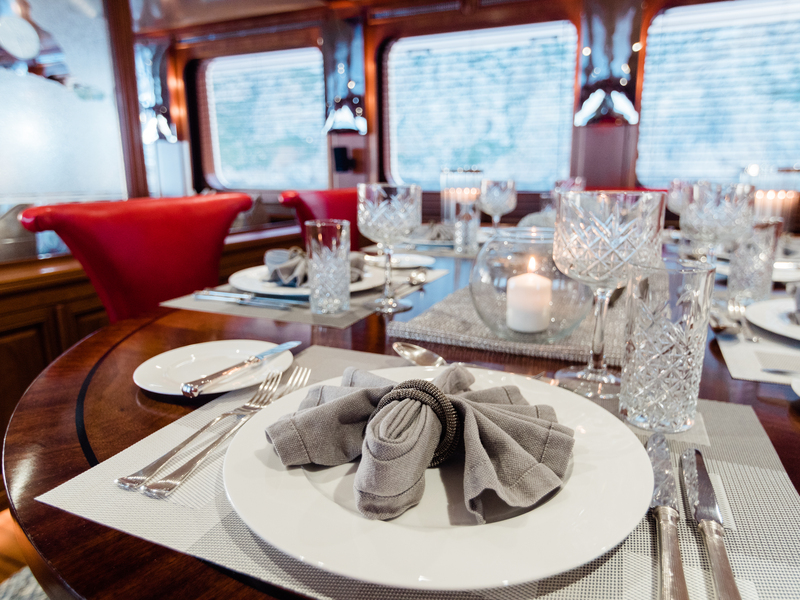 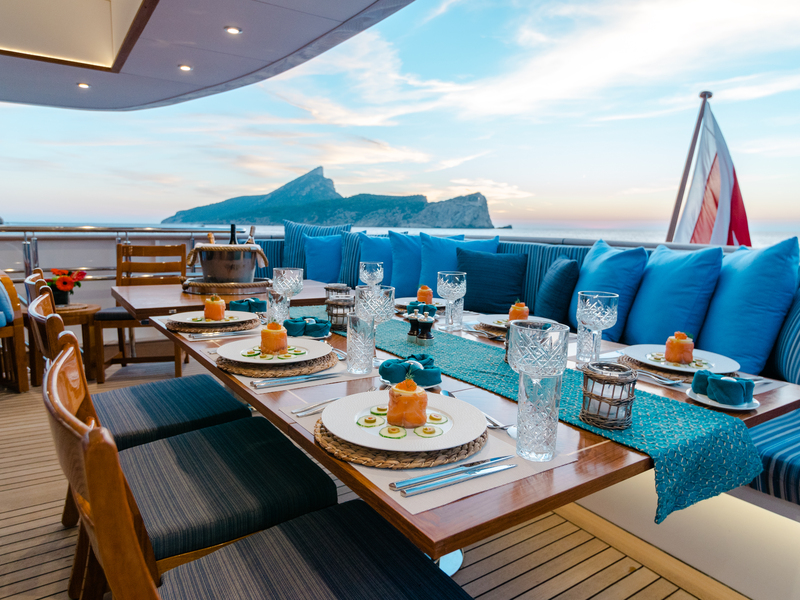 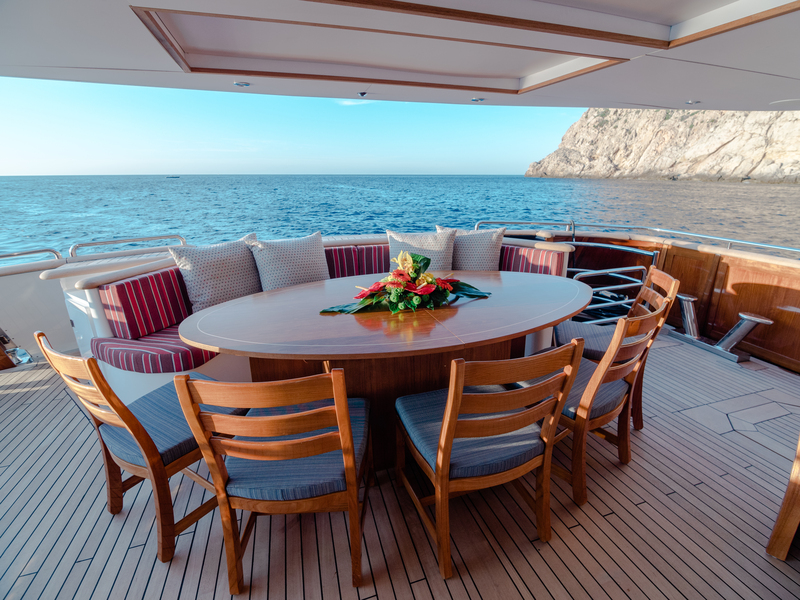 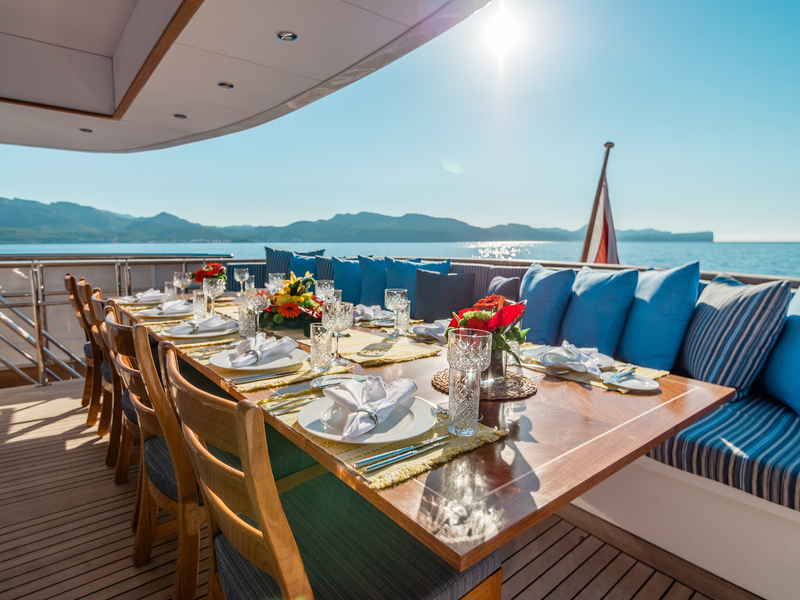 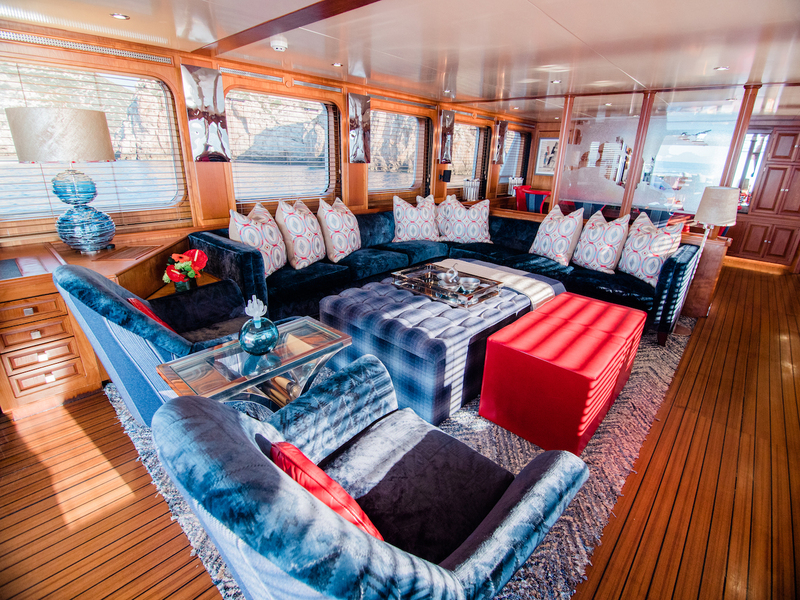 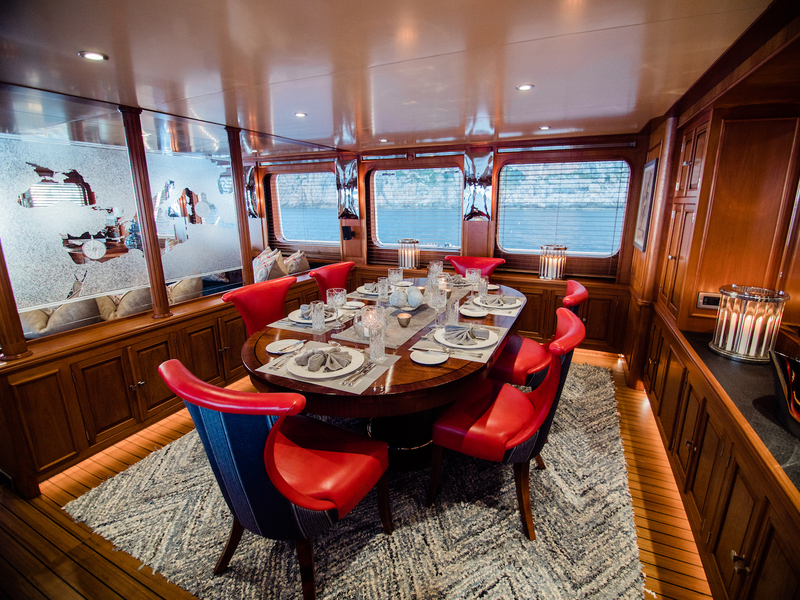 The upper deck also has a sofa integrated along the aft, and its larger size coupled with an elongated table creates an elegant alfresco dining area for up to 12 guests. 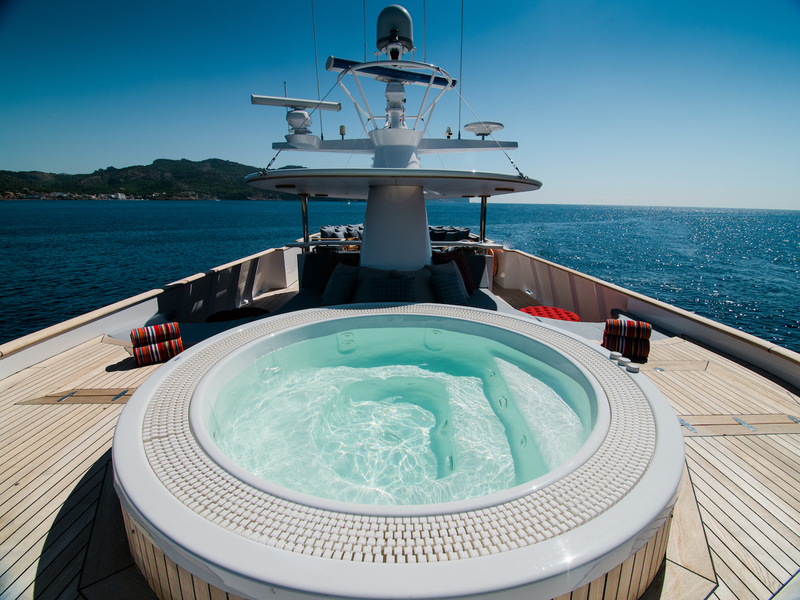 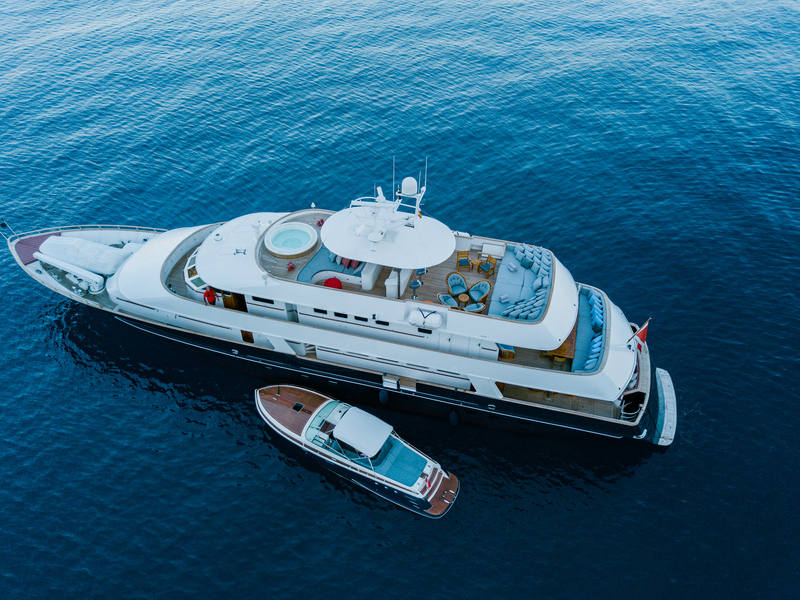 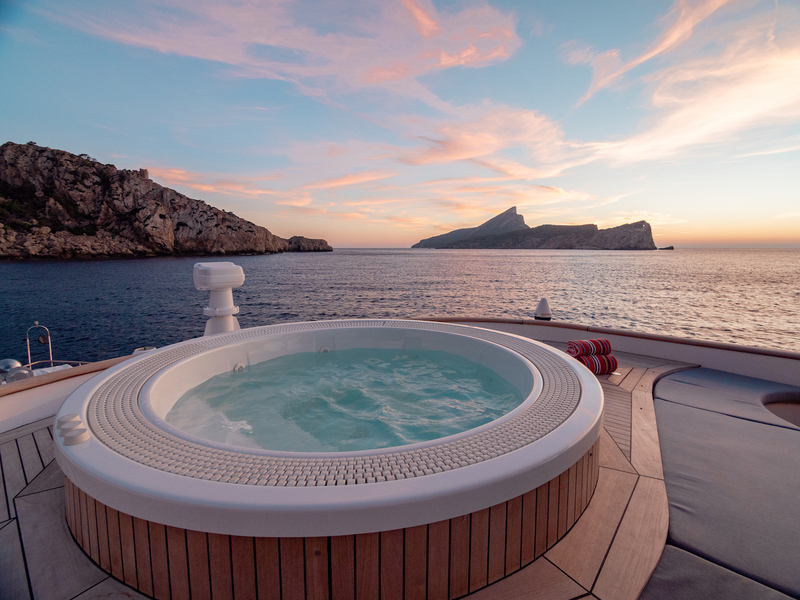 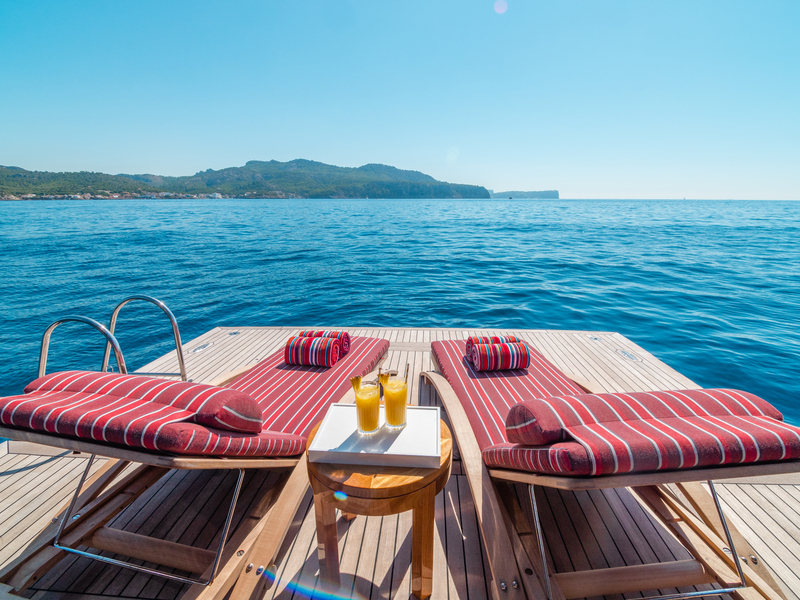 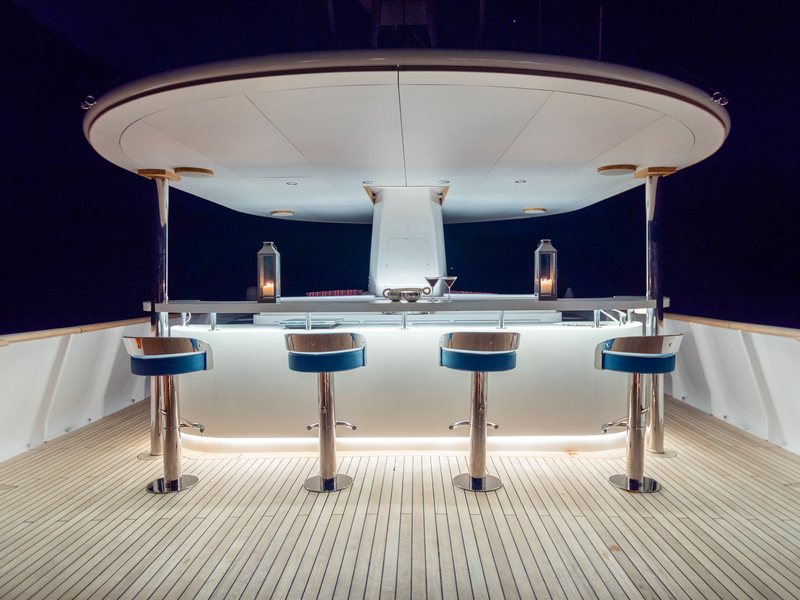 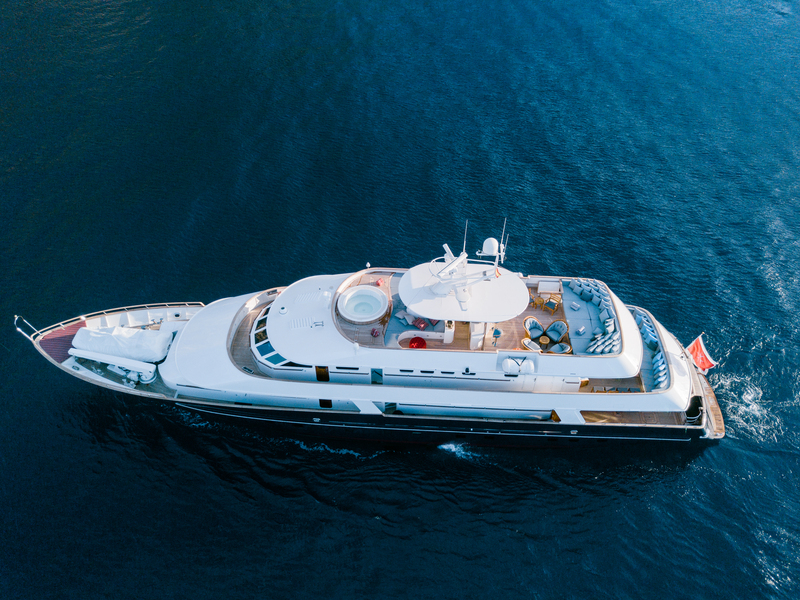 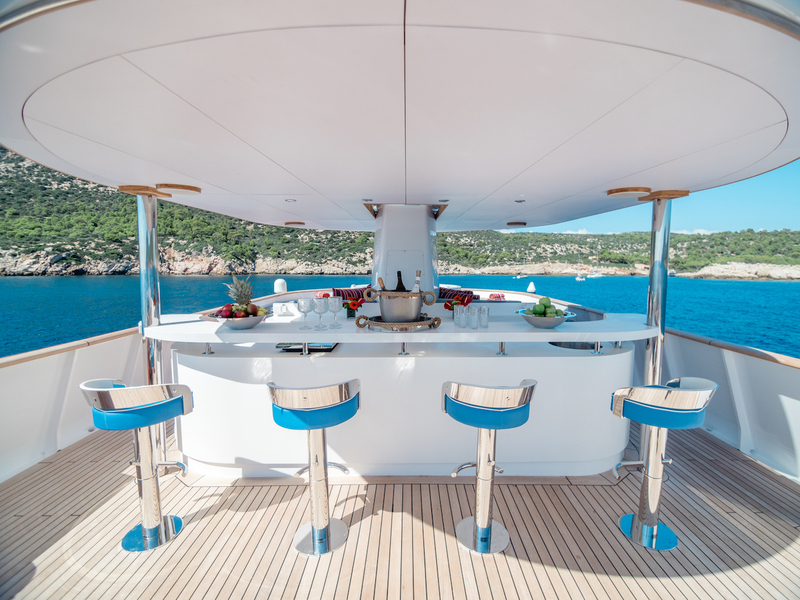 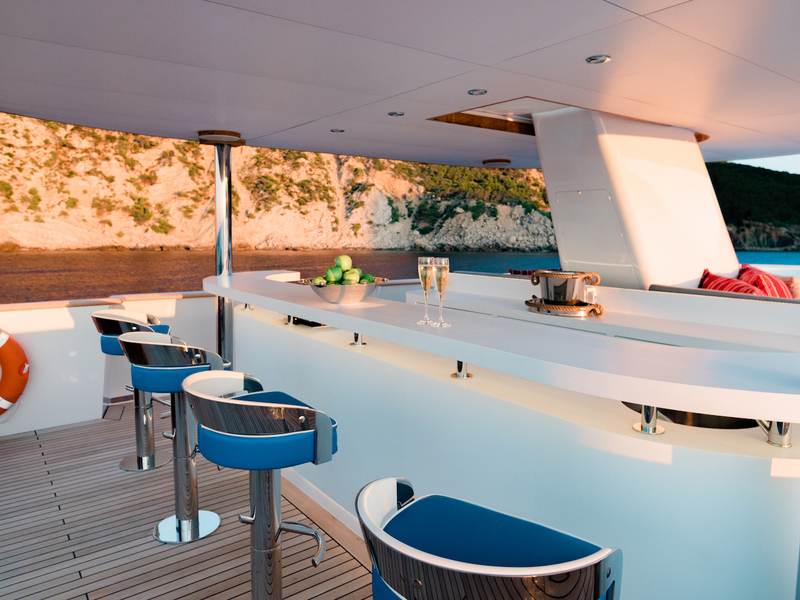 Above, the sundeck is divided between sun-drenched sunbeds and seating to the aft, a wet bar with seating for four beneath the hardtop and sunpads as well as a forward Jacuzzi that takes in panoramic views. 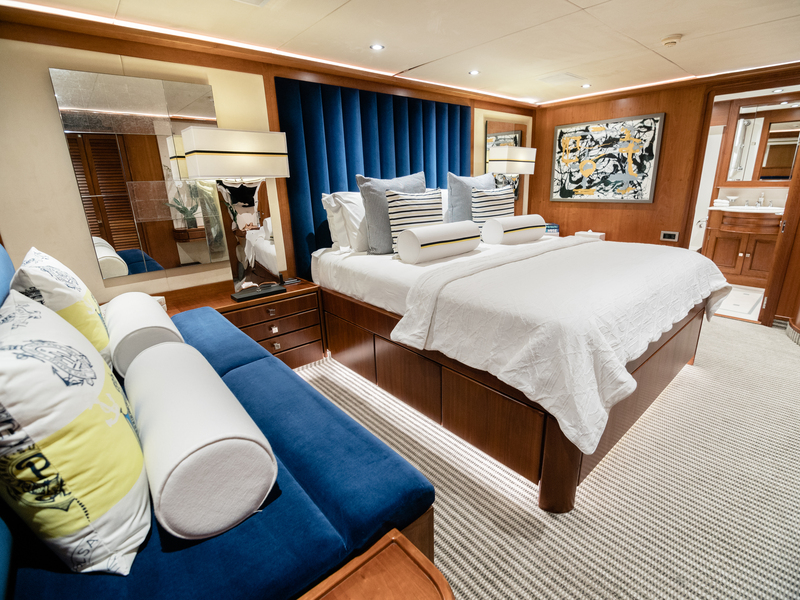 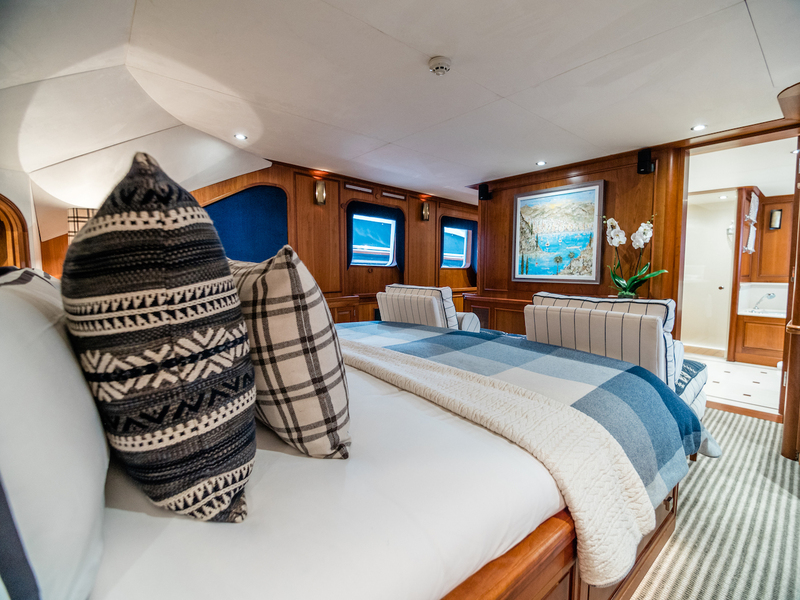 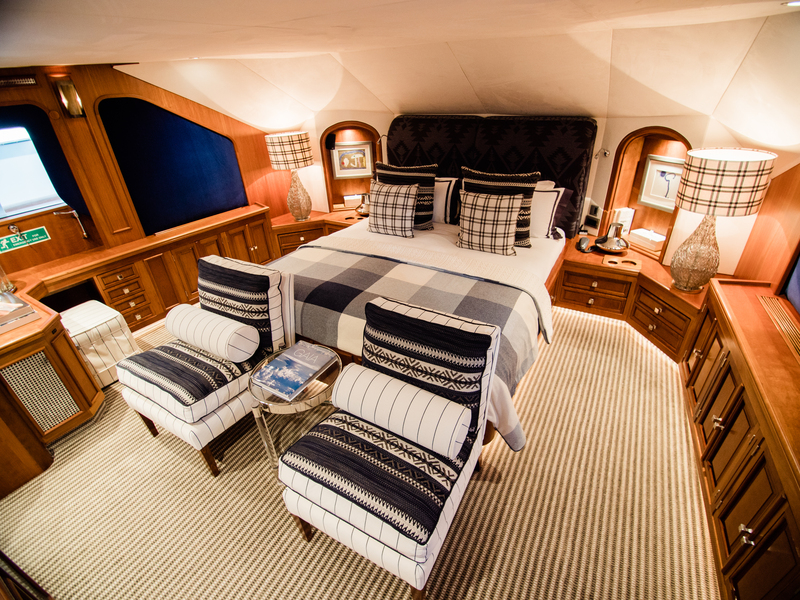 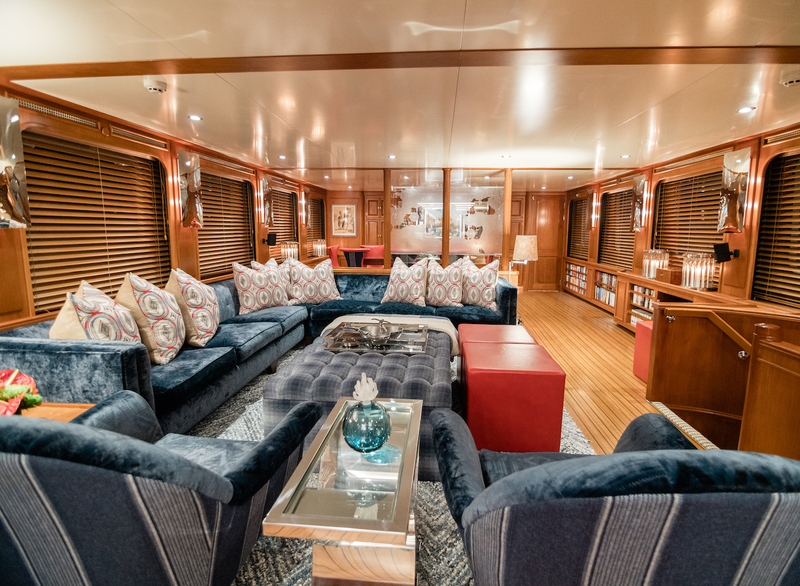 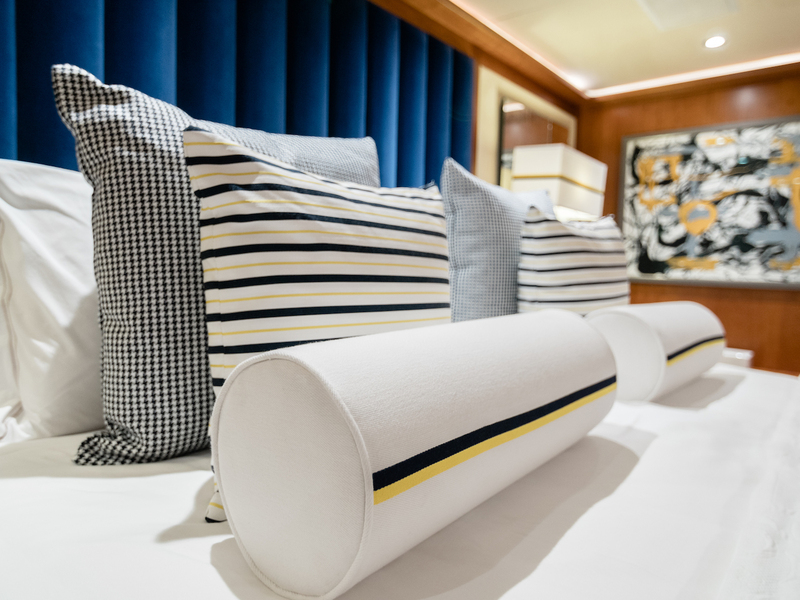 The lower deck hosts the guest and crew accommodation, with the Master suite on the main deck forward, behind which is the main foyer followed by the formal dining area and the main salon. 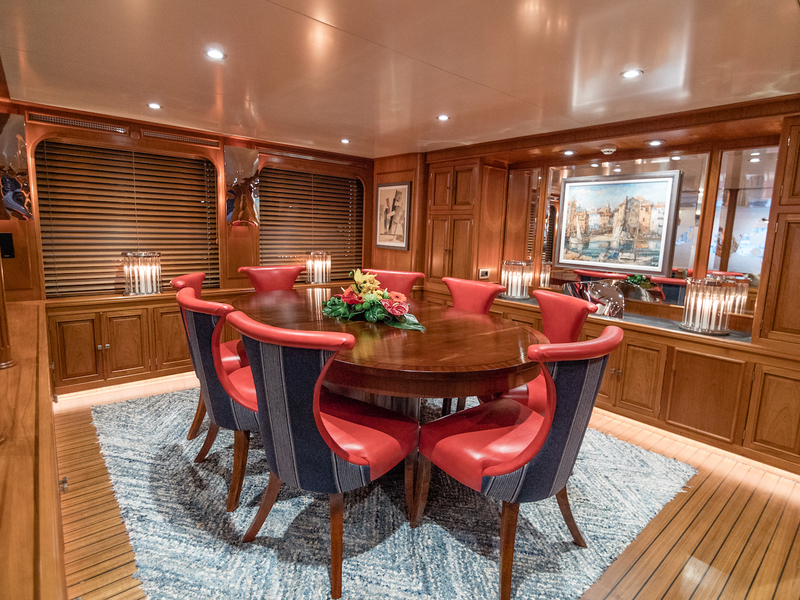 Inside, the forward formal dining area is a blend of classic and modern styles, providing plush seating in cerise leather and blue fabrics for up to six guests around a grand oval table. 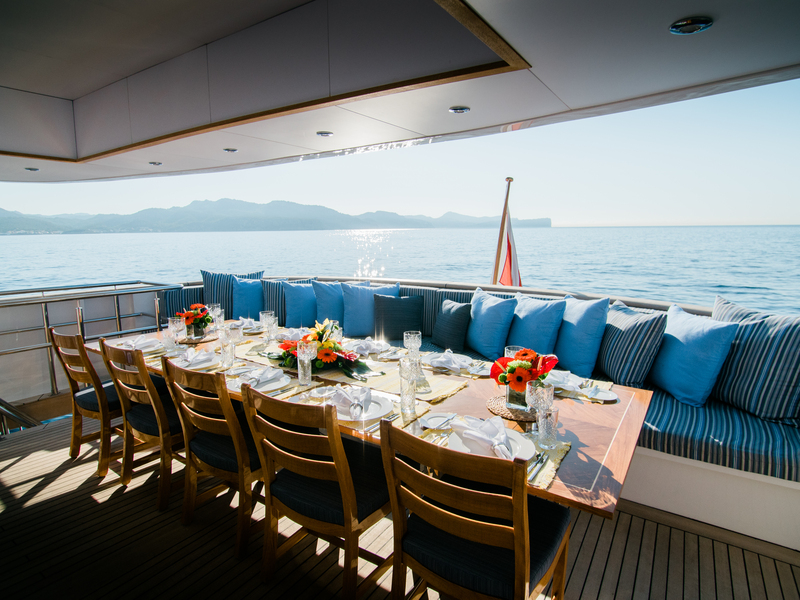 Large windows on both sides allow for plenty of light and excellent views. 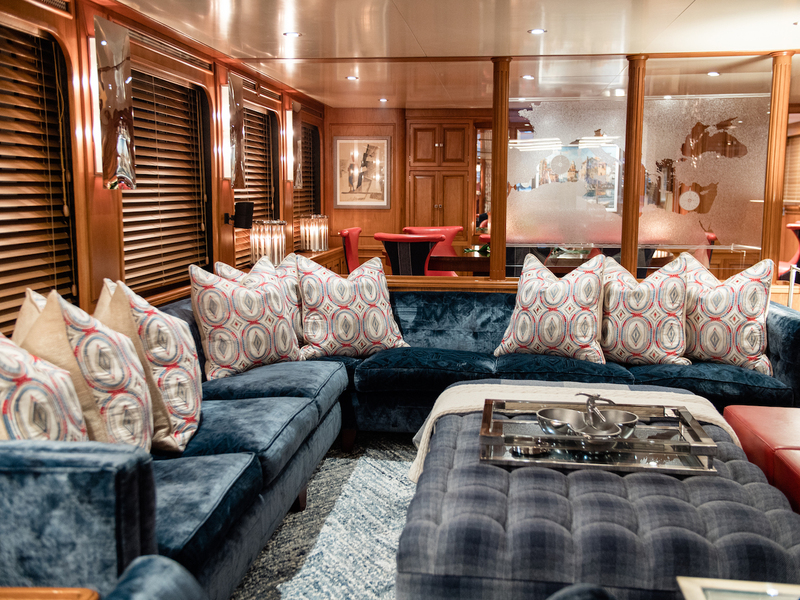 Cabinetry and frosted glass panelling separate the dining room from the aft salon, which contains an L-shaped sofa in blue velvet coupled with two inviting armchairs that face forward around a padded ottoman. 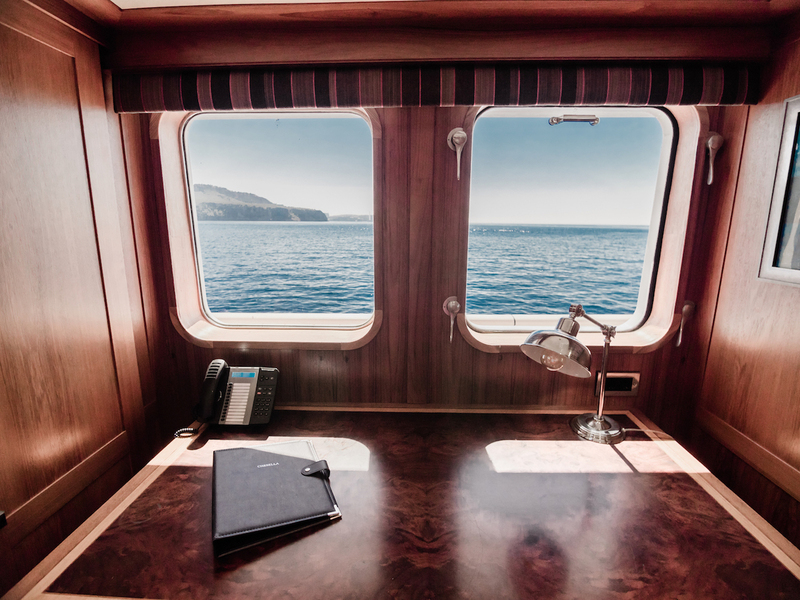 A deck and computer are placed in the port aft corner. 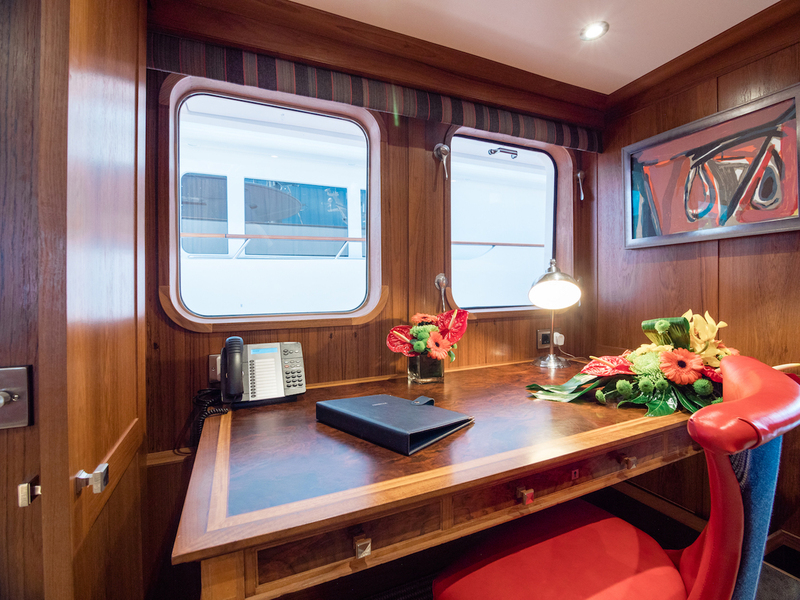 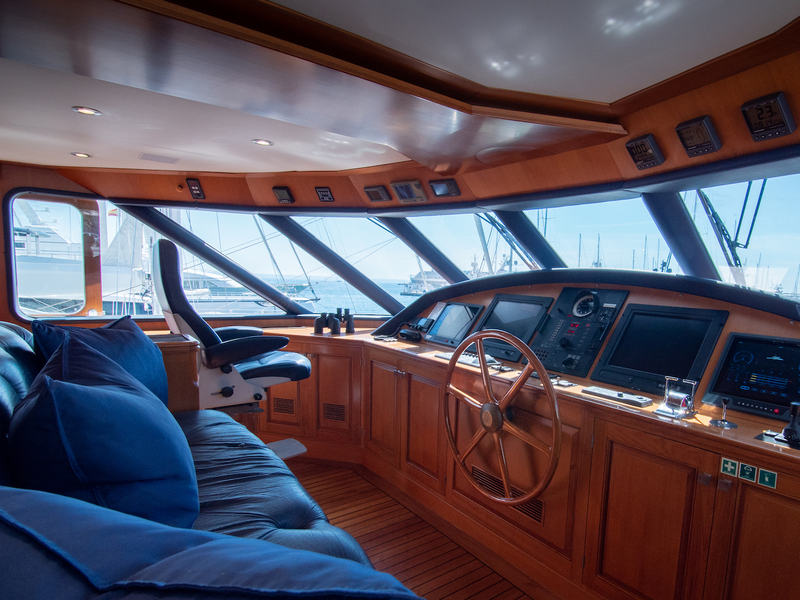 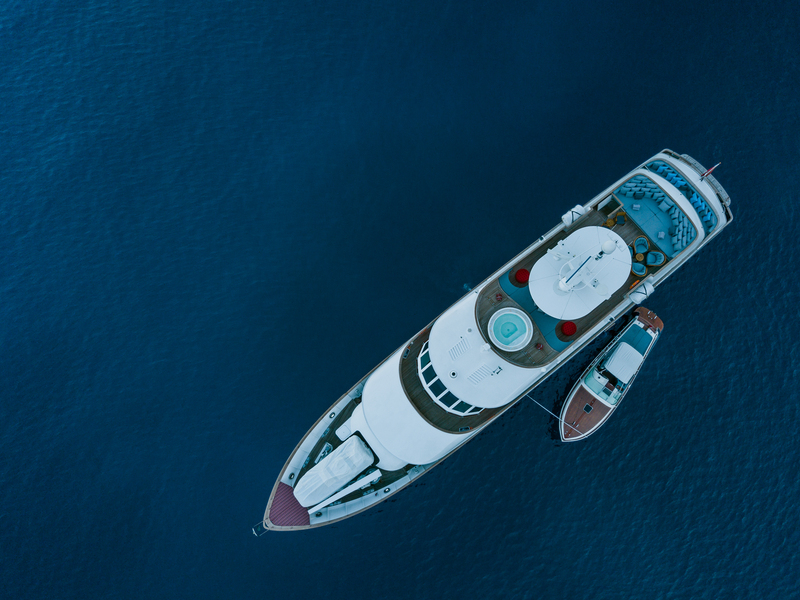 The upper deck forward hosts the helm station followed by the Captain's cabin and foyer, behind which is a cosy skylounge for tranquil relaxation. 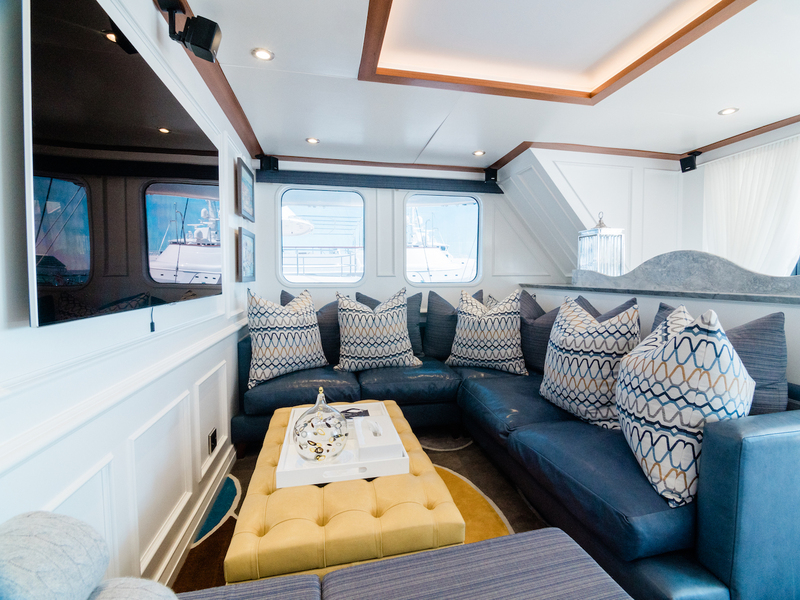 A widescreen TV is mounted on the forward starboard wall with a corner seating area behind. 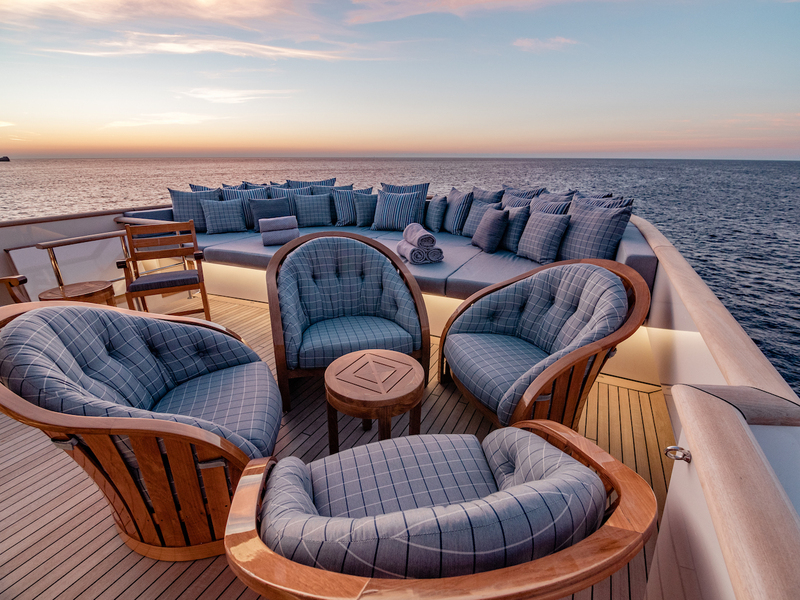 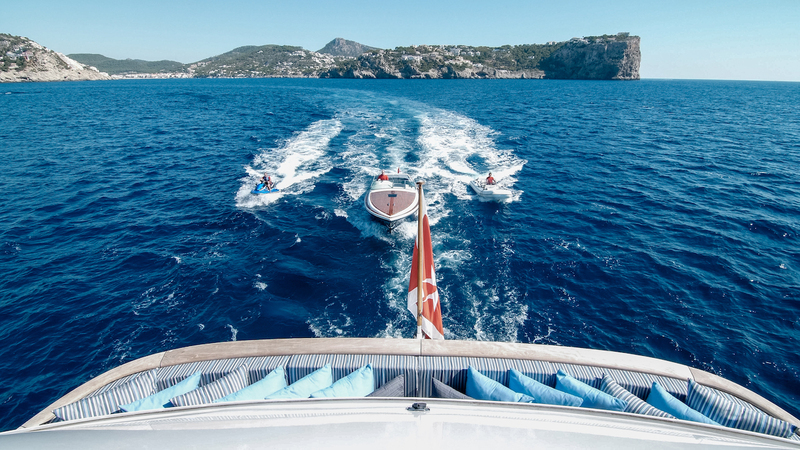 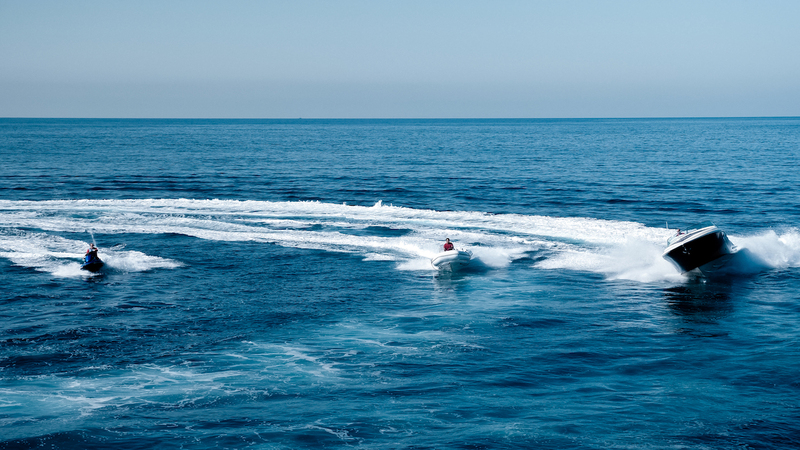 A pair of Caterpillar INC 3412 DITA 425 HP engines produce a cruising speed of 10 knots and a top speed of 12 knots, at which M/Y CHESELLA has a range of 3,200 nautical miles. 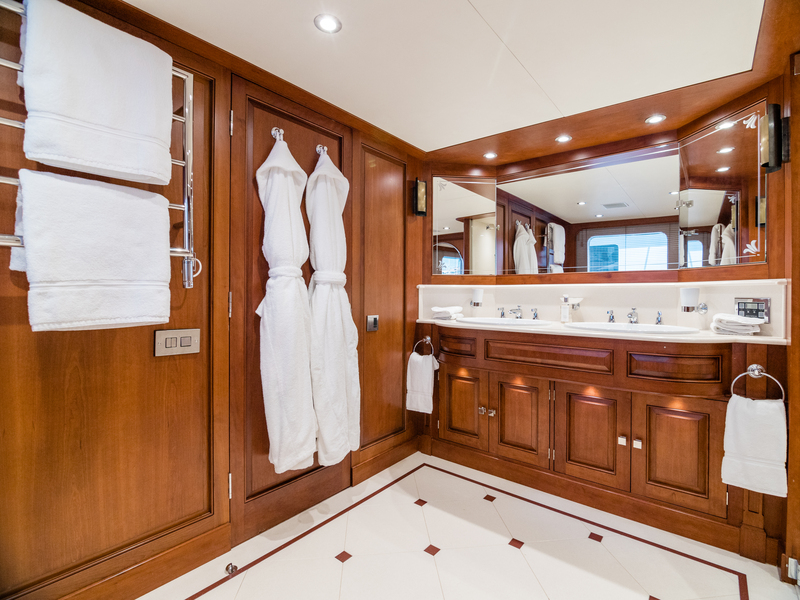 The accommodation sleeps a maximum of 12 guests across 6 en-suite cabins: 1 Master suite, 1 VIP stateroom, 1 double cabin and 2 twin cabins each with a Pullman berth, all located on the lower deck except for the Master suite, which is situated on the main deck forward. 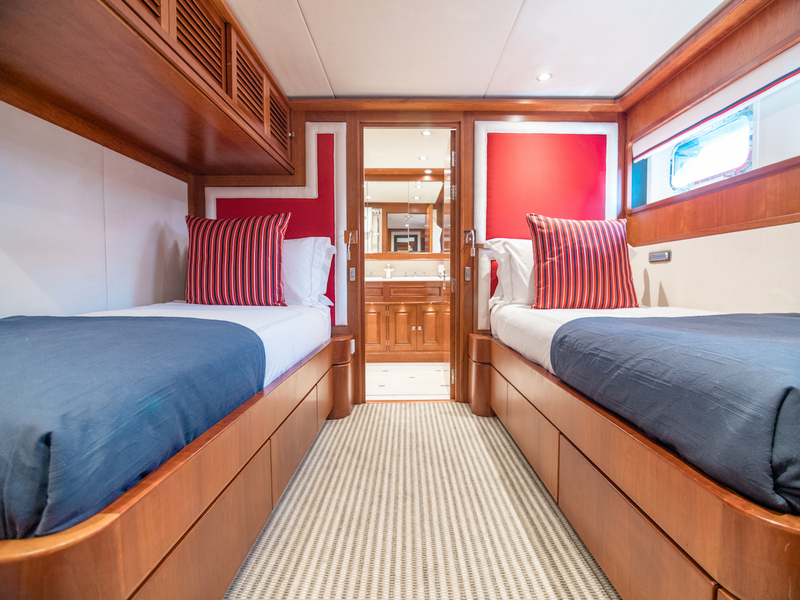 The Master suite contains a king-sized bed plus two armchairs. 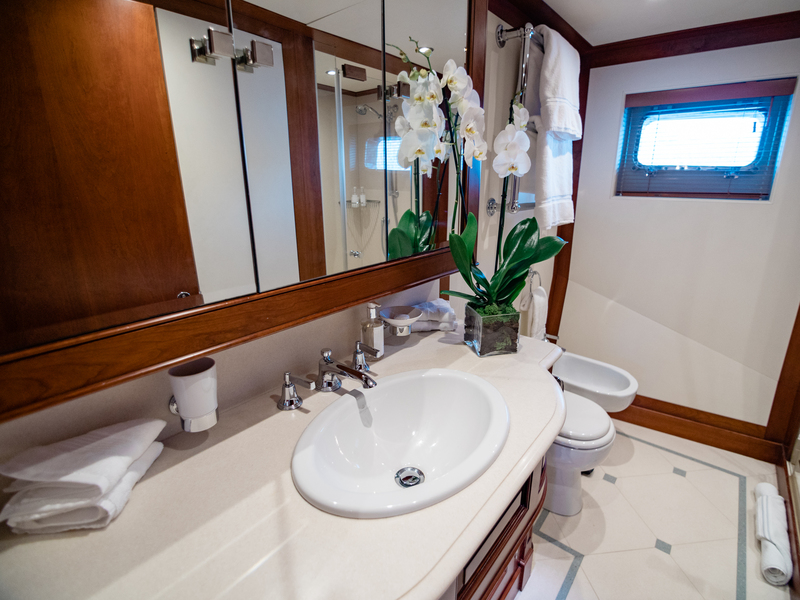 The en-suite bathroom has his-and-hers sinks, a shower and bathtub set within a spacious marble and varnished wood bathroom. 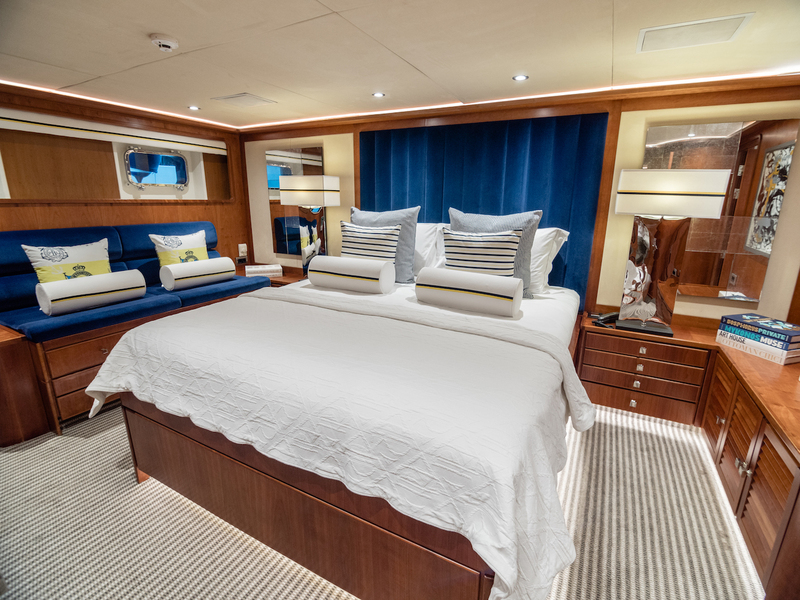 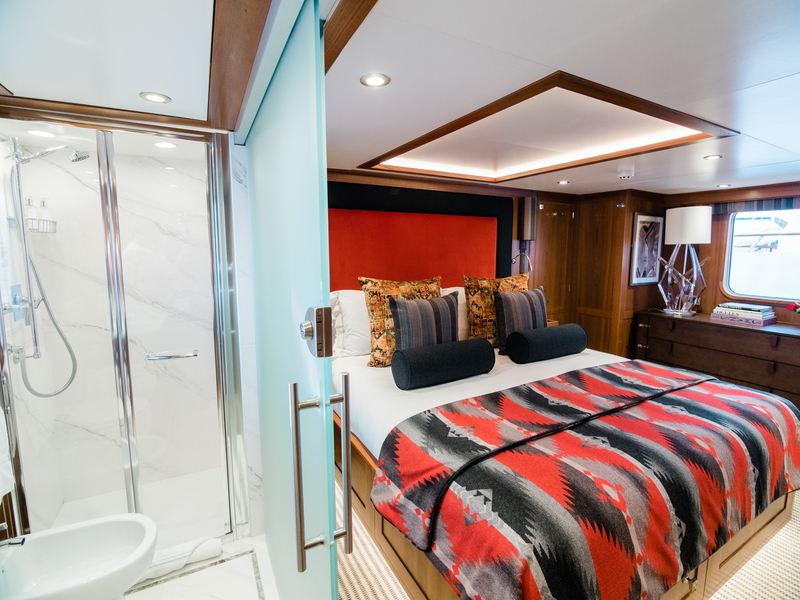 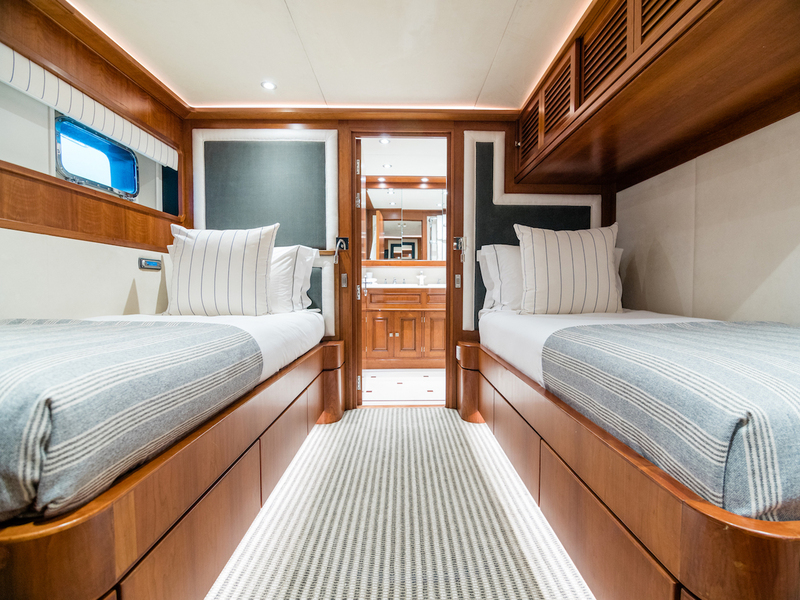 The VIP stateroom also has a king-sized bed and its own day lounger, while the double cabin is just as spacious with a double bed and frosted glass sliding doors to the bathroom to let in the natural light while ensuring privacy. 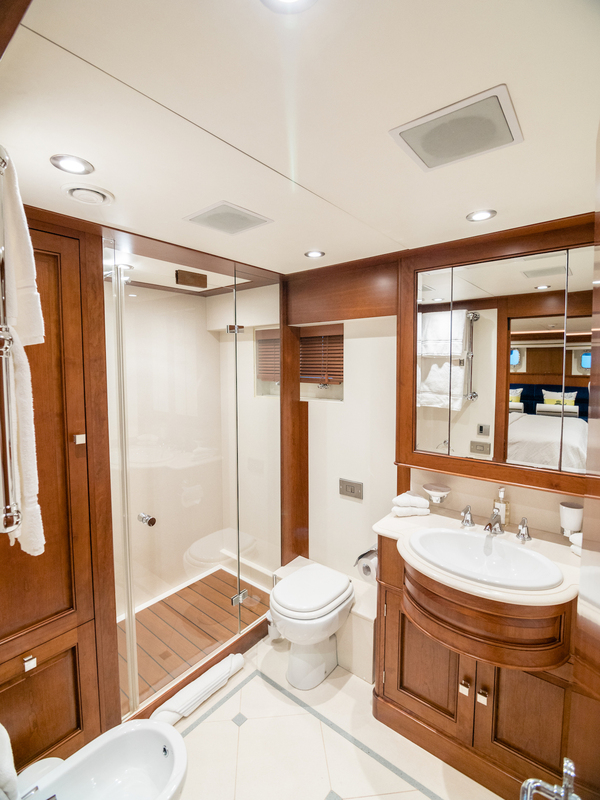 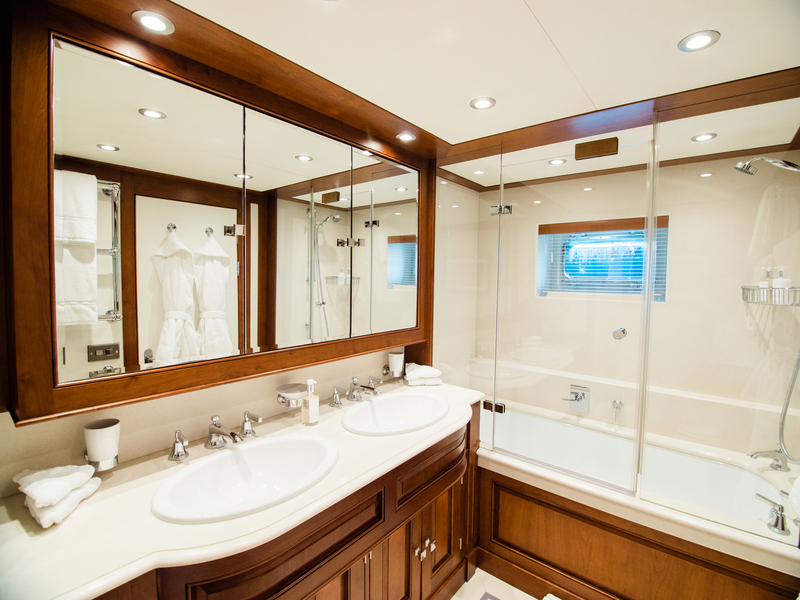 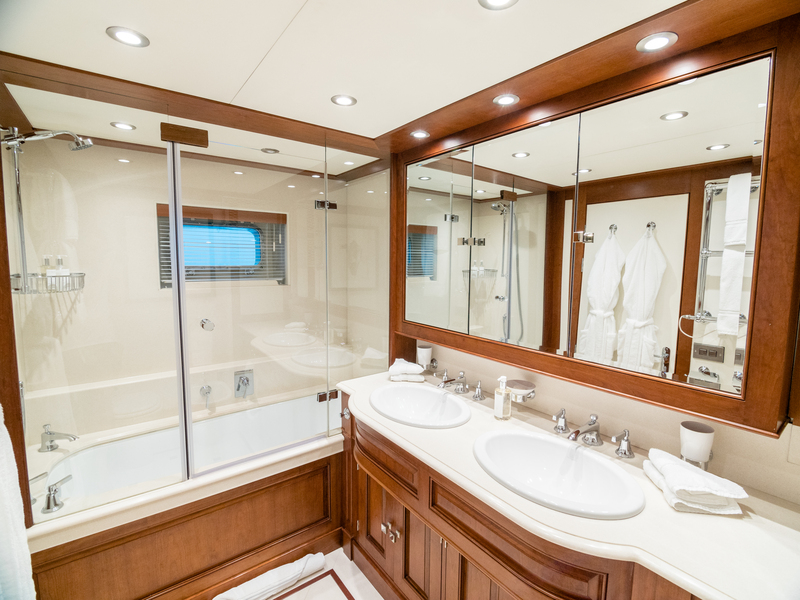 Both twin cabins have a door between the beds that leads through to a generously proportioned bathroom. 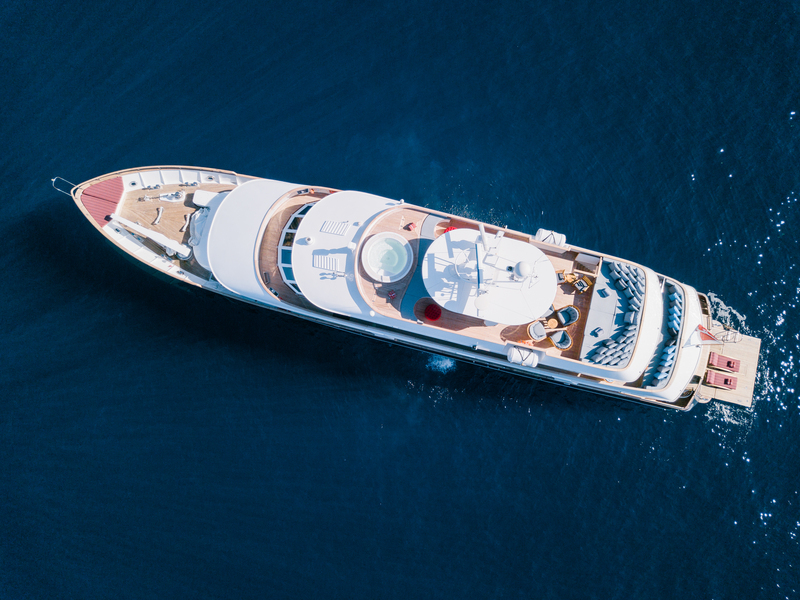 The crew of 7 will ensure that everyone on board receives stellar service throughout their cruise.